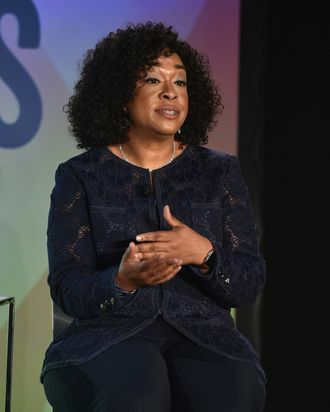 Shonda Rhimes is a master of exits. In her five television shows, she’s had to kill off, maim, or slowly disappear countless characters. But it turns out the exit of Callie Torres from Grey’s Anatomy wasn’t long in the works at all. (Sara Ramirez made the announcement she wouldn’t be returning on Instagram on Friday.) In fact, the Grey’s Anatomy finale was already finished when Rhimes found out Ramirez wouldn’t be back for next season. There are no hard feelings, however, as their mutual social media posts suggested earlier this week. (Rhimes tweeted that Sara “will always have a home at Shondaland.”) “I love the woman and I want everything for her so it all worked out in that sense,” Rhimes said.